Now, of course, the improbability factor of this one has been blown away by the entrance of Yao Ming into the National Basketball Association. Yao, having just completed his first NBA season with the Houston Rockets, hails from Shanghai, stands a formidable 7′5″ (2.29m), and has begun something of a revolution in ethnic pride, in some ways comparable to when Jackie Robinson became the first black player to enter the ranks of Major League Baseball. That’s quite a declaration, I know: Being a Chinese national in America in 2003 is a far cry from being African-American in 1947, and Yao is actually not the first Chinese in the NBA. That honor belongs to Wang Zhizhi. But the pride and mania that have followed Yao’s entrance into the NBA have reached unusually epic proportions, and at every game the Houston Rockets played this past year, all across America, arenas saw an enormously larger percentage of chest-thumping Asian fans in the crowd than normal. Oddly enough, this Yao-induced pride nearly didn’t get materialize. Yao had a slow start to the season - early on, he even tripped and fell on the court with no on else anywhere close to him, causing his own teammates to erupt in laughter. But later, after Yao blocked the first three shots Shaquille O’Neil tried to toss in when the Rockets played the Los Angeles Lakers game, Chinese Pride, yea, Asian Pride in the USA reached what may be an all-time high, making Yao a symbolic hero of Chinese everywhere. What’s more, after the Lee Wen Ho Ordeal, which many of my Chinese friends in America tell me was a vicariously demoralizing period for them, Chinese in the USA were virtually desperate for a hero of this stature. Yao also starred his own “Visa Card” commercial this year, debuting during the Super Bowl, a certifiable mark that one is a hot commodity. Not even Shaquille O’Neal got that. To catch up on all the mania that is Yao Ming, head to - where else? 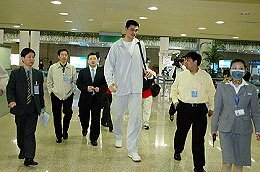 - the Yao Ming Mania web site, then check out more at the Yao Ming Fan Club .